Reminder: September's Virtual Tasting is this Thursday from 7-8pm Pacific Time. Read more about it here. The 2010 Harvest is underway in Washington State. Over the coming weeks, I will provide regular updates on what is picked, where, and when. One of this week’s updates comes from Jonathan Sauer at Red Willow and Les Vignes de Marcoux vineyards in the Yakima Valley. Red Willow, one of the state’s finest vineyards, is the furthest western vineyard within the Yakima Valley. Sauer says that while the vineyard is not a particularly warm site, it is typically an early vineyard. Winemaker James Mantone of Syncline Wine Cellars says that the winery has not yet begun harvesting grapes. Mantone, however, is not concerned. 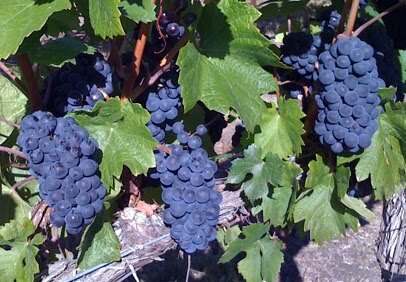 He says this "may be the best Syrah harvest I've seen in my eleven years in Washington." The picture at the top shows Pinot Noir grapes at Evergreen Vineyard, courtesy of Kyra Wines. Grower Mike Wade of Fielding Hills sent along pictures from his Riverbend Vineyard in the Wahluke Slope. The first picture shows seeds from Merlot grapes, one manner of assessing ripeness. 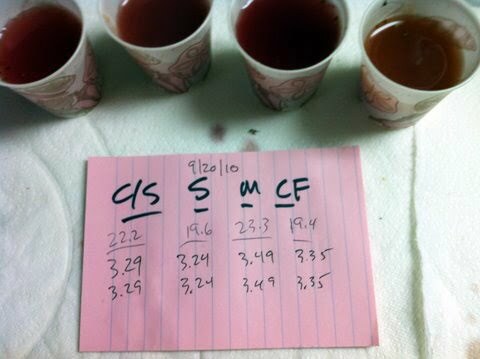 Another picture shows juice from Riverbend grapes along with technical information. The information in the table below is aggregated from personal correspondence with growers and winemakers, as well as information posted on Twitter and Facebook. If you wish to send data for your grapes or vineyards (or correct any of the information below), please email me at wawinereport@gmail.com, leave a comment below, or leave a comment on the WWR Facebook page. ¼ picked. Tempranillo close. Les Collines Syrah close. The Wallula Gap vineyard is not Columbia Gorge. Thanks for the correction James. You may want to check with Todd Newhouse of Upland Vineyards to see how Snipes Mountain is doing. Thanks Alphonse. Reached out to Todd yesterday but haven't heard anything back yet. Hope to include the information in next week's update. We picked up Merlot from Jones of Washington yesterday (9/21) at 23.5 brix. Really happy with the juice flavor. Kim, thanks for the update! Heard an interesting comment from a winemaker today.... "This will either be the best vintage or the worst vintage in recent memory" - (depending on the timing of the first frost). Terroirist, a great quote. Crossing my fingers that the cold weather comes late! Update for Snipes Mountain from Todd's surrogate. Picking Tempranillo this Friday the 24th, Syrahs are a week out. Cabernets (Sauvs and Francs) are generally very early here but this year are more in line with the other warm areas in the State and hovering in the 22 brix range. Garnacha (I'm sorry Grenache) is already at 23+ brix. Riesling is surprisingly on pace with past years. Great site any year, the best site this year. Javier, thanks for the Snipes update. People are pretty excited about that site. Tested the Riesling from OS Fruit (Vineheart) yesterday which is where I, and many other home winemakers, source their fruit. 20.32 Brix, acids still high, will give it hang time. Last year at this time we were 2 weeks from first freeze on 10/10 but I picked my Riesling on 10/24 because this knob north of Prosser is a well drained site. If they hang that long again this year, it should make a good wine. If I don't screw it up. Chris, thanks for the update. Much appreciated. I don't quite agree with the anonymous quote restated by Terroirist. It's not either going to be the worst or best vintage. While I always stay away from early predictions; we are close enough to this one that nothing we can comfortably state that earlier varietals at warmer sites are positioned to make great wines. Fortunately, the weather gods have provided a nice somewhat above average temperature forecast for the predictable next 7 plus days. That certainly makes me feel better about later varietals at cooler sites. 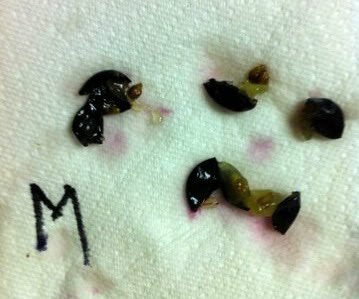 Lastly, I would suggest that while the unusual growing season looks to have positioned some sites to pick lower brix fruit with excellent flavors, we have seen sugars climb at some sites in the last week or so to those more common higher Brix numbers (25 plus) with acids that are still too high to pick (by flavor, not just numbers). I see some beautiful fruit out there close to being ready, but have yet to start harvest. I make no whites and my first pick is normally Seven Hills Syrah. Zach B., SYZYGY. Zach, thanks for the comment and I wish that my magical powers could fix the comment! Such an interesting year. With everything trending cooler even into September, suddenly we are faced with a week-plus of above average temperatures! Seemingly just what the doctor ordered. I will be posting another harvest update this Wednesday. Tempranillo / Grenache / Merlot coming off Wednesday from Horse Heaven and Red Mountain. We are certainly seeing some very nice flavor development in vineyard sites with well balanced crop tonnage. An interesting trend in the last 1.5 weeks is a disproportionate drop in TA numbers vs. brix/pH rise. TA is dropping by 1g/L with pH hardly moving and brix increases of 1-1.5 degrees. Syrah from Rattlesnake Hills and Horse Heaven seems to be holding above 7 g/L TA, with brix approaching 23.5. Likely to start by the end of the weekend into next week for Syrah. Cab Sauv on Red Mountain seems like it will be a week +, but not at the lower brix I was hoping for. Happy Harvest! Eric, thanks for the update. I will be including some of this information in my harvest update tomorrow. What vineyard sources are you using from Horse Heaven and Red Mountain?